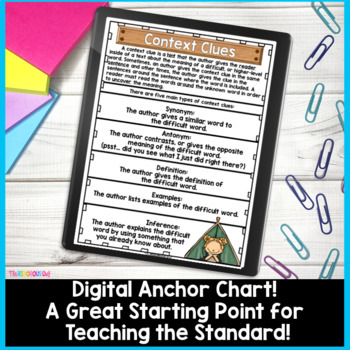 Using Context Clues is a crucial skill that readers need in order to access the text. Get a week's worth of lessons that go from the introduction of the standard to assessment! 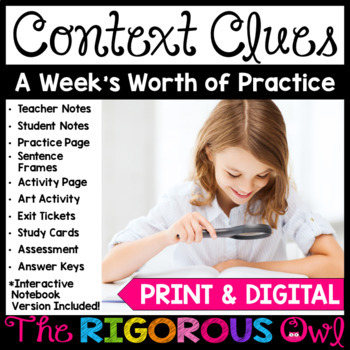 Activity Page: Students read the posts on the Context Clue Trail and determine the meaning of the words. 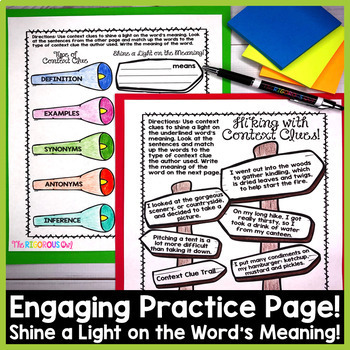 Students then match up the sign to the correct flashlight to “shine a light” on the word’s meaning! A fun activity page practicing the standard! 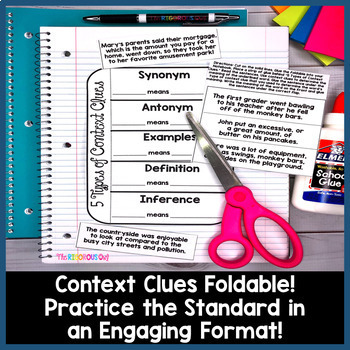 Sentence Frames (Full Page Version and Interactive Notebook Version): 10 frames/ stems to use throughout the week... or over the course of the year! Study Cards! Glue onto an index card and study for the assessment! A great School to Home Connection! This pack is intended for ONE CLASSROOM TEACHER to use. If you would like to share with your colleagues, please purchase an additional license. Thank you for respecting my hard work!